← Where did the word ‘meme’ come from? This is Part III of the epic Balkan road trip I undertook with my friend Lara over one crazy weekend in September 2016. For Part I please click here and for Part II please click here. 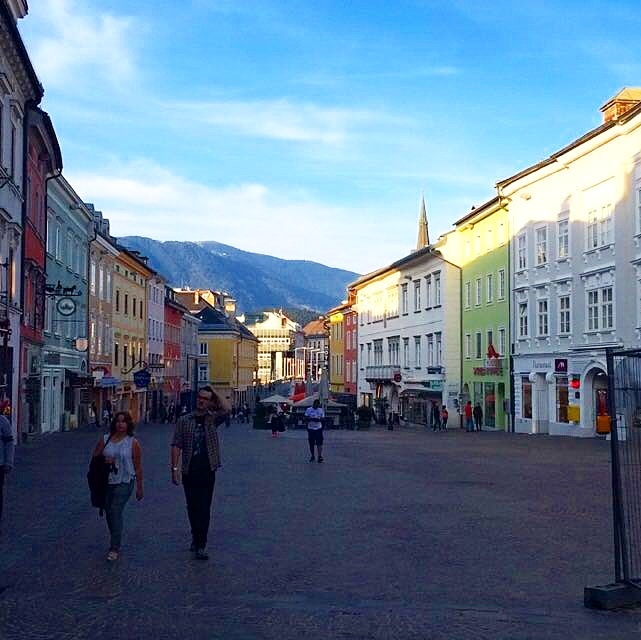 Despite being the seventh largest city in Austria, Villach gives off vibes more suited to a retirement home than of a place with a population touching 60,000 people. Saying that, upon walking up the cobbled high street to the main square, it appeared that a high percentage of these residents may well qualify for a bus pass and extraction of their state pension. It was early evening on a mild Autumn Saturday, but the place was so eerie quiet that a zombie apocalypse could have wiped through the town centre the previous day. The tourist board would describe this as ‘quaint’. We passed a moustache shop and multi-coloured trinket stores before stopping near a water fountain for a breather. Lara embraced the sophisticated atmosphere by sipping on champagne as we took in the Alpine surroundings. The air was fresh and crisp, but also had a distinct sense of wealth running through it. Not the new wealth of the digital nomads typing away on their Macbooks at the other side of the bar, mind you, but of heritage, wealth passed down through geographically concentrated family ties. It was like the tunnel we’d passed through to get to Villach was the wardrobe to Narnia and we were now through the looking glass. Lara had pre-booked a cheap apartment in Zagreb, Croatia for that night; not knowing exactly where the road would lead us but with a rough idea of where we would need to end up in order to reach the surprise she had in store the following evening. 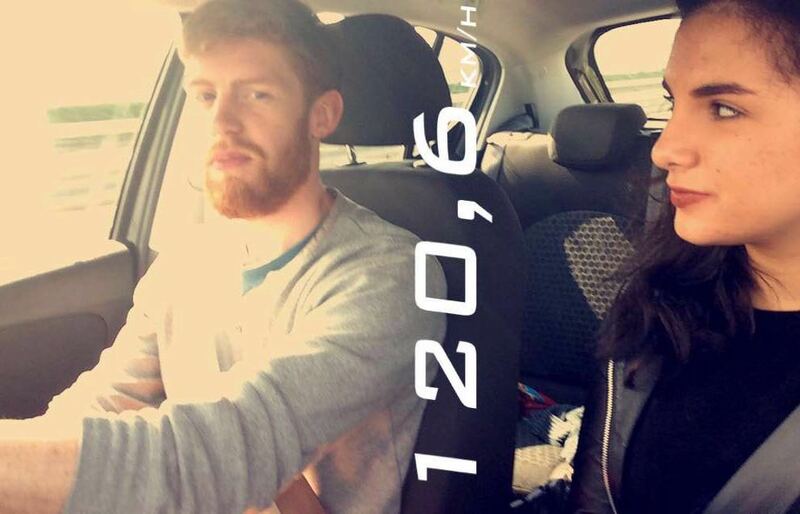 It was a 240km journey and night had fallen upon us. Settling our bill, we left the land of the upper echelons and made our way back through the €7.50 tunnel. Re-entering Slovenia, Lara breathed a sigh of relief, threw off her shoes, rested her head, and let Tom, the sat-nav, lead us towards the Croatian capital. About halfway into this leg of the journey, I pulled off the highway to grab some food. Luckily, the services we stopped at had an Aldi and McDonalds in addition to the fuelling station. As Lara nipped into the supermarket to get some shower gel and conditioner, I wandered into the fast food chain and perused the menu above the counter. If Lara hasn’t forgotten at least one thing when you are away with her, then something really strange has occurred. We hadn’t even been away one day and she’d already informed me that her contact lenses, a host of toiletries, and a spare pair of shoes had all been accidentally left behind. That was small time, however, compared to the following week. I would have a Skype session with her once she’d started University classes and be informed that she’d left her credit card back home. For four days she would use her charm, charisma, and those big brown puppy dog eyes to get free coffee, sandwiches, and beer. Some girl. Ever since seeing Morgan Spurlock’s incredible documentary Supersize Me, one of my life rules is that I will never eat a McDonalds, KFC, or Burger King unless absolutely necessary. Even if I’m as drunk as a pirate stranded on a desert island with a cask of rum, the internal workings of my brain usually still prevent me from ordering anything other than the odd McFlurry. I was ravenous, however, so whilst waiting for the Italian princess I loaded up an order of chicken wraps, large fries, and cappuccinos. With the Pokémon Go craze in full swing, I also noted that you could add toy Pokémon to your order, so threw a Psyduck and Squirtle into the mix. At least this way, if Lara were to fall asleep, I’d have something to talk to. It may be more reminiscent of the relationship between Tom Hanks and his volleyball, Wilson, in Castaway, but from the homeless-looking hitchhikers we’d passed on the dark roads, I was much more confident that at least this wouldn’t result in a murder. We reached Zagreb, bleary-eyed, around 10pm; two hours after our last check-in time. Fortunately, Lara had had the wherewithal to give the dude renting out the property a call when we were back on the shores of Lake Bled. Adopting her poshest Croatian accent, she politely informed him that we may be slightly tardy with our arrival and asked whether this would be an issue. Not only did he say that he’d stay and wait for us, but he also offered to waive the additional fee which was usually imposed. She’s just a got a way with words. Whereas Lara’s manipulation skills are second-to-none, however, her navigation skills are comparable to those of a blind woman. The apartment was situated bang in the middle of the city and unbeknownst to us it’s harder to find a parking space in Zagreb on a Saturday night than it is to find a fresh water source in the remote Sahara. We drove round and round in circles for forty-five minutes; frustration growing with each lap as I was given such unhelpful directions as ‘you should have turned left back there’ and ‘you really should be three lanes to the right’. Human beings seem to become different beasts when on the road, their vehicles acting as alter egos to their usual calm selves. 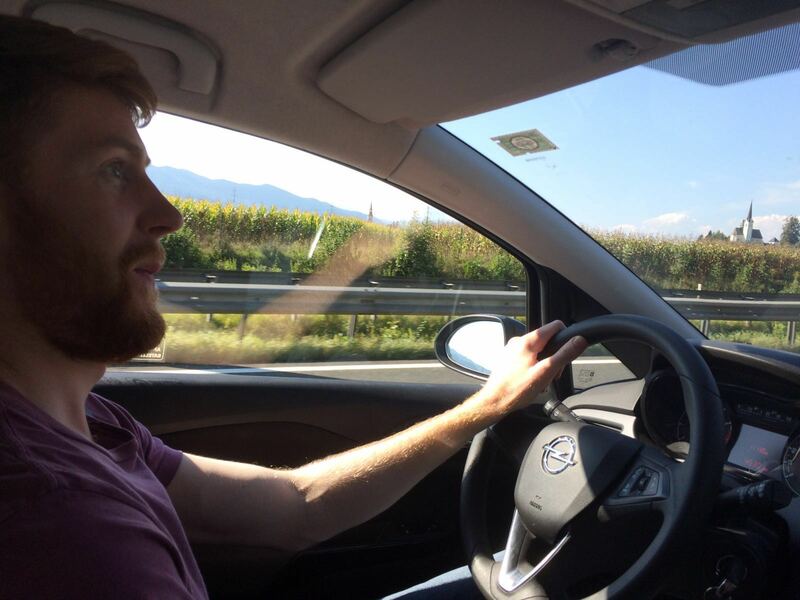 Driving an Italian registered car, in Croatia, on the opposite side from what I’m used to, was sending me down a one-way street to anger management classes. The tipping point came when the killer trams started getting involved in the road rage. One second I’d be approaching a flashing amber light, trying to figure out whether that meant I should stop or keep going through the junction, when the next a four-carriage death machine would come out of nowhere, hurling along its track that zig-zagged traffic lanes and stopping for no one. Put the Dalai Lama himself behind the wheel of our Corsa and I guarantee that within five minutes he’d be swearing like a gangster in a Guy Richie movie. I eventually got so completely fed up that I pulled into a permit-only zone and bashed the hazard lights on. “Eh, I don’t think we should stop here,” said Lara. I looked in the rear-view mirror and spotted the uniformed gentleman marching in our direction. There was no time to escape. As Meatloaf has warned us all, objects in the rearview mirror (may appear closer than they are). My shotgun rider opened the passenger door and stepped out to speak with the man, who was now close enough that I could see his police badge and uniform. The two had a natter in Croatian, there were a few hand gestures which looked like he was giving her directions, and then she returned to the car. Without saying a word I turned the key in the ignition and we screeched off. I rounded the main square and to my delight saw a large white ‘P’ against a blue background, the universal sign for parking. It was a multi-story car park, so would likely cost us an arm and a leg for an overnight stay, but at that point, I didn’t care. At that point, you could have told me that I’d have to play a game of Russian Roulette at the ticket machine in order to leave and I still would have entered the barrier and down the narrow concrete ramp to the lower level. Taking the bags from the boot, we cut through Zrinjevac Park. As my feet crunched on the loose gravel I couldn’t help but notice that every single bench in the place was occupied by people drinking beer. It wasn’t a homeless house party either, but teenagers who had clearly snuck out with their mates or girlfriends to get a little liquid courage before hitting the clubs. More than anything else I’d seen on this little excursion so far, it reminded me of Glasgow and home. It was 11pm when we eventually rang the bell of 15 Pavla Hatza for Apartment & Rooms Flowers, one of the most strangely named accommodations I’ve stayed in. The light in the hallway immediately went on and the door was answered by a young guy with a beaming smile. He was slightly overweight and had a brown leather satchel slung across his torso. For €50 per night, the apartment was ideal, with a kitchenette area, massive shower, and use of a free coffee machine. It was a different type of drink I was in need of after that journey, however. I glanced towards Lara and she started to chuckle. “Let’s check it out,” she shrugged. We sat at a table in the covered courtyard and ordered a couple of pints of Ozujsko, one of the most popular local brands of beer. I spied that they also had Brewdog on the menu, a Scottish craft beer of which I’m an investor in the company, but the bartender told us that they had unfortunately sold out. I began to wonder how many of the other beers on the menu were actually ‘out of stock’ but got distracted by Lara’s peculiar choice of outfit. Under her signature patched leather jacket, the girl appeared to be wearing pyjamas. “Are you wearing a nightie?” I scoffed. “It’s silk material and you’re not wearing a bra,” I retorted. 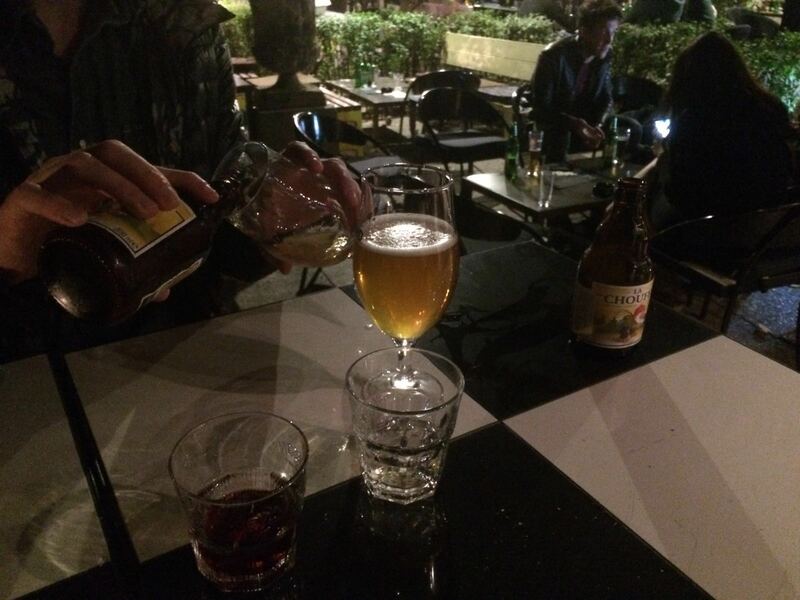 As we threw back shots of Rakija, a 40% fruit brandy, and intermittently sipped strong Belgian beer, Lara downloaded an App of the game Never Have I Ever onto her phone. Hunched on two wobbly stools in that bustling Zagreb dive bar we proceeded to truthfully answer some of the most personal questions imaginable. Giggling throughout and with not a moment’s hesitation. I find that when time spent with someone is limited, you feel all that more comfortable in revealing things about yourself that you’d never imagine opening up about. Why waste precious moments fluff taking when you can get under each other’s skin and attempt to figure out their thoughts and experiences of life, the Universe and everything? I’m not going to document what we discussed, as that is between Lara and myself, but one look in her eyes as we paid the tab and I was already gone. Defining our relationship to others has been a challenge. We’re happy to leave that line blank and just say that it is what it is, but apparently, that’s not good enough. The human race is a nosey species and loves the dirt. I’m as much of an open book as any. These publications are, in a way, a literal documentation of my feelings and perspectives of the World. There are some things though that don’t need to be boxed and put into words. When people say ‘think outside the box’, I ask them ‘why does there even need to be a box?’ Our responses have ranged from ‘partners in crime’ to ‘best friends’ to our one-word shut-down ‘complicated’. If I personally had to describe what we have, however, it would be that our relationship is like ‘a smoke break’. It’s up to you to interpret that how you wish. We carried each other drunkenly home and I fell asleep, with Lara nestled against my chest.